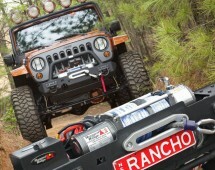 The “Boss” series winch is the perfect choice for 4WD enthusiasts who want the very best. 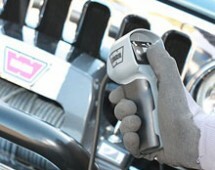 They are designed not only to look tough but provide fault free operation under the toughest of Australian conditions. Category: Winches. Tags: Boss 9500lb, winch. 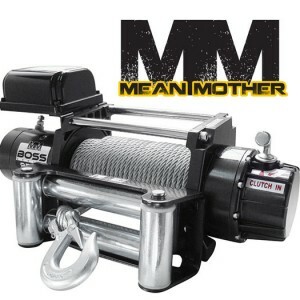 The “Boss” series winch is the perfect choice for even the most discerning 4WD enthusiasts. They are designed not only to look tough, but provide fault-free operation under the toughest of Australian conditions. When I first met Mean Mother’s BDM Chris Roberts, we had a lot of other projects on the board, and to be frank, thought the last thing we needed to do was to add another winch line. However, Chris’s passion for the brand and product knowledge was so unique, I couldn’t help but stop and take notice. The intelligence and commitment that has gone into building the Boss series winch is incredible. From design and function, to the parts components specified and their related tolerances, the Boss winch is both ‘freak’ and ‘friend’. The manufacturing plant which produces and assembles the Boss winch is operated with military precision. The initiatives and programs in place to ensure that each winch leaves the factory as it ought to are mind-boggling. Each winch in the BOSS series features a three stage planetary gearbox with BS 1/2 H2600 sintered bronze bushings and S45C hardened carbon steel gears, providing superior strength even when working under the toughest of conditions. These bushings have been pressed and stamped (no pop rivets) into the gear carrier. A sliding ring gear clutch provides maximum strength and efficiency in forward and reverse winching operations with ease of free spool functionality. Each gear box is assembled and lubricated using synthetic grease and conforms to their strict assembly guidelines. Providing strength and enduring the pulling forces exerted is a hardened seamless steel drum assembly. The in-drum brake system features automatic direct drive load holding and Kevlar brake pads for improved safety. This solenoid is housed in a sleek and stylish control box which has a waterproof plug. The heavy duty hand control comes with a 5 metre power cord offering the user complete control and flexibility to stand well clear of the winch during operation. The BOSS series winch uses a high quality efficient 12 volt 4.6hp series-wound motor offering performance and reliability in the toughest of conditions. 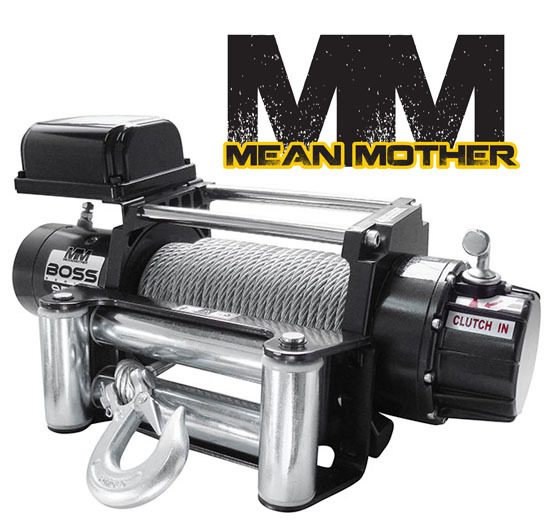 So confident are Mean Mother in the quality and design of the BOSS series winches, they offer a limited lifetime mechanical component warranty, and 2-year electrical component warranty. If you already have steel cable or synthetic rope in good condition, or want to fit a different size cable or rope, you can opt to purchase the winch in a BARE FORMAT. Basically this means the winch does not include steel cable, roller fairlead or clevis hook, therefore saving you time & money. To ensure the very best manufacturing processes are undertaken in the building of the BOSS series winches, they have developed their own detailed testing procedures to ensure they meet and exceed their engineering , performance and quality benchmarks. All testing is performed with the 1st layer of winch cable on the drum. The standard base plates have been uniquely designed to give maximum clearance between the tie bars and the winch drum. There are also optional tie bar extensions available which provide an additional clearance of 25mm (1″) between the tie bars and drum assembly. This offers extra clearance for “competition use” without the need for a specialised mounting system and the expense of a high mount winch. If all these features weren’t enough, all BOSS series winches have been equipped with T.C.C.P.C. (Tinned Coated Copper Power Cables) with PVC insulation and the additional protection of a fiberglass outer sheath. Tinning involves coating each individual strand of copper housed inside the cable core. This process greatly increases the life of the power cable and is regarded as the ultimate in corrosion protection.